All transactions are safe and secure with a reliable history in online purchasing behind each of our associates. 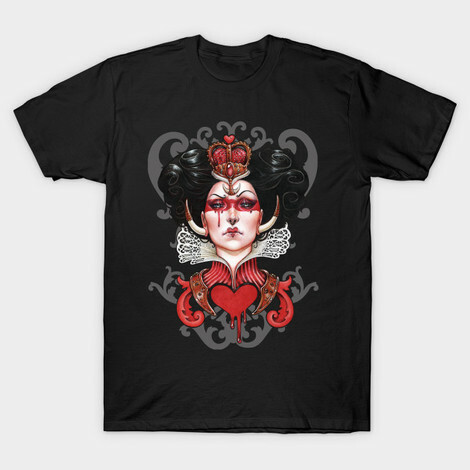 Buy the Red Queen t-shirt to own Alice in Wonderland clothing and merchandise. This unique design features a darker take on The Red Queen, if that's possible. She only has one way of settling grievances, "Off with his head!" she shouts. This explains why the playing cards paint the roses red. After planting white roses by mistake, the cards cheerily paint the roses red for fear of losing their heads. Grab this Alice in Wonderland shirt today in an effort to please the queen. After all, if the queen isn't happy, no one is happy and she'll shriek "off with their heads!" It's also a great way to teach your boyfriend not to argue with you. In addition to the Red Queen tee above, browse the Alice in Wonderland Clothing Gallery for more apparel like men's and women's clothes, kids shirts or hoodies.